This Anna Maier Couture gown is so elegant! This gown has clean lines, beautiful lace detailing, a dramatic train, and luxurious taupe inner silk charmeuse lining (seriously, so classically romantic and strapless). This is never been worn or altered. I bought this from Glamour Closet, a sample store in New York. I really do love this dress, but ultimately decided on something different for my wedding. You can wear this dress as is, or add a tulle skirt, lace sleeves, anything your heart desires. 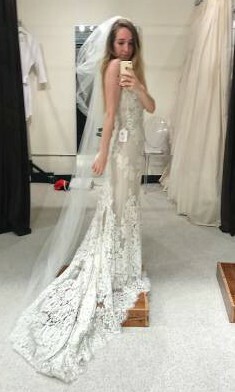 I hope someone can wear this beautiful gown on their wedding day! !